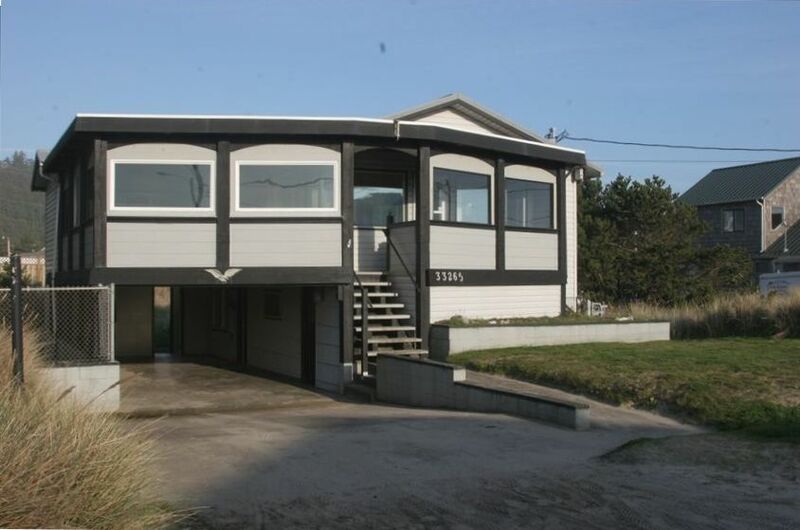 This great home has easy beach access right across the street. It has great views of Cape Kiwanda and the Pacific Ocean. It is conveniently located less than a one minute walk to the Pelican Pub, the coffee shop and the beach. The location is very kid friendly and you can just pull up and not have to get back in your car until you leave. The home features reverse living with two living areas, one on each floor. It is a very cozy home and has a great wood burning fireplace for you and your friends and children to relax to. There is a separate ping pong room with great views of the ocean. You will find all the beds and bedding to be extremely comfortable and each living area has its own TV and DVD player. There is high speed internet access. The upstairs has the master bedroom with a full bathroom and the downstairs has two bedrooms, one with two sets of bunk beds and the other with a queen-size bed. The downstairs has a full bathroom with a claw foot tub and a pull out futon in the living area. There is a fenced in back yard and covered parking. I am an active male that loves the beach and the activities that it and the ocean provide. I have a small active family. Close to the beach, easy access to amenities, family friendly and nice views. Being able to walk accross the street to access the beach. Having one of the closest homes to access the most desirable part of the beach(Cape Kiwanda,tide pools etc. ).Convenience of walking to restaurants, coffee shops and convenient stores. Having nice cape and ocean views. Our family loves making a fire at the end of a long day outside or stormy day inside. Ping pong battles and being able to grab a surfboard and be in the ocean in less than two minutes. Our family had a wonderful extended weekend! The house had everything we needed! I would rent it again! Second time staying here and always a blast! Very clean, great fully fenced yard for the puppers, and perfect location. Highly recommended! Nice little beach house for a quick girls weekend. Loved how close we were to the beach and local amenities. We had a great time. The house had everything we needed. Location, location. Beds and couches comfortable. Very clean. Everything was great we would stay here again!